I don’t think it will come as any surprise to you when I say that I love chocolate! I am, as you will probably also guess, no stranger to the wonders of Hotel Chocolat and before the children came along and started sucking money left, right and centre, I belonged to their monthly chocolate club. So my reply was pretty swift when the email hit my inbox asking if I’d like to review their Twinkle Toes Nibbling Kit! 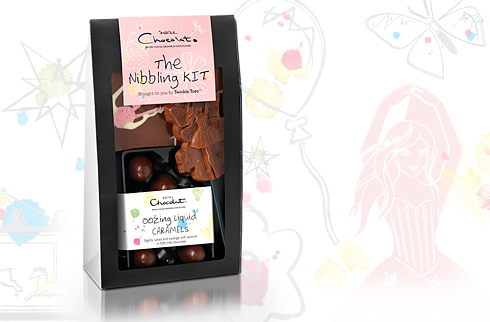 This yummy kit, ideal for treating the little princess in your life, contains a Twinkle Toes Milk Chocolate Slab, Liquid Caramels and a Milk Chocolate Twinkle Toes Lick. As you would expect from Hotel Chocolat, it is delicious, good quality chocolate – none of that ‘waxy leaves a greasy film in your mouth’ nonsense and is reasonably priced at £11. The oozing liquid caramels are quite possibly one of the best things I have ever tasted and I’m not even going to embarrass myself by telling you how fast they vanished. And no, I did not share them! However, I’m not a totally mean mama so I did let the girls have a nibble on the Twinkle Toes Lick. If you like the sound of this then you are in luck as the lovely people at Hotel Chocolat have offered to give one of these little kits away to one of my readers. Fab, eh? All you have to do enter is leave me a comment below telling me what your favourite chocolate is. This is a review post – I was sent a free sample to devour. The giveaway is now closed – thanks for your entries. I will update with the winner shortly.